We are on the cusp of the arrival of warmer weathers as daffodils and tulips start rearing their beautiful heads and we start turning the central heating thermostat down (slightly) and thinking ahead to upcoming calendar dates… we will be wearing flip-flops before we know it! The diary is a bit like buses, we have little to ‘look forward to’ for months and then all of a sudden we have Easter and two May bank holiday weekends in quick succession, so if you haven’t already started making exciting plans for these long weekend breaks, hadn’t you better start? Work can often get in the way and take up too much of your time, so let your life get a look in. We are just close enough, yet just far enough away to make for a weekend away treat. If you’ve had a busy few months and looking forward to spending some quality time out with your loved one, away from the inbox and stresses of work, make the most of every second of your extended weekend, pack your bags and escape to our dreamy Pub and Inn here in Odiham, Hampshire. Book a night (or two…or three) here at The Red Lion, Odiham at just £95 per night on our Easter Bed & Breakfast package or for just £90 per night over the May Bank Holiday weekends, based on two people sharing a room. 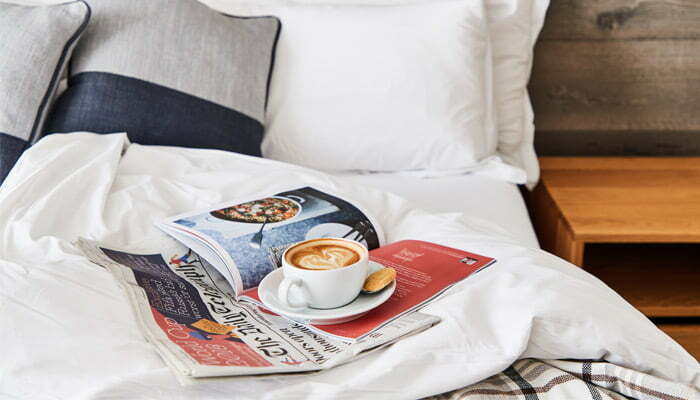 Spend your days chilling (we have a whole bar downstairs, the world really is your oyster), catching up on your zzz’s or the latest boxset; or head out and explore what the local area has to offer. There’s everything you could want within 30 minutes (by car) including retail therapy, antique shops, beautiful walks, the movies, theatre and so much more. Or, if you’ve escaped from the city by train, there’s some lovely walks and the high street of shops right here on your doorstep. 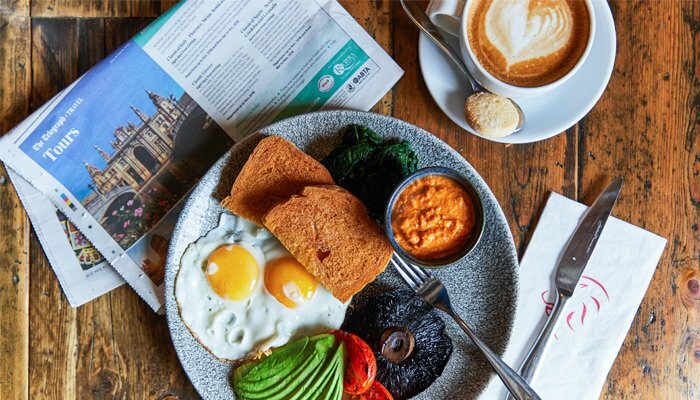 Included in your stay is the most delicious locally sourced, free-range, lovingly prepared breakfast; where else could you get such a luxury weekend escape that doesn’t break the bank? An invigorating rain shower, luxury ESPA toiletries, Hampshire’s very own Choose Chocolate and your own coffee machine to play with… sometimes it’s just the simple things that make us smile. Indulge in a romantic dinner and catch up. 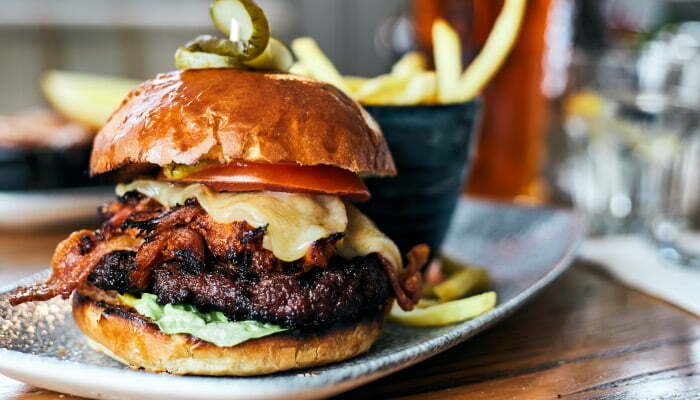 Our menus are seasonal and so you will have a terrific choice of spring-inspired dishes from both our a la carte and the daily specials board, you will feel very spoilt (and full!). Make the most of not needing a designated driver and pair your food with something delicious from our drinks list; we stock award-winning local sparkling wines from Hampshire and Surrey, award-winning local ales from Tilford Brewery and every gin brand you can think of, including the award-winning Silent Pool. Book your stay online or if you’d like to make your stay even more special and order some extra-special touches (champagne, beer, flowers) then get in touch with Edina and her team on 01256 701145.